The year was 1885, the month June, the place Seoul. Signs on the street warned, on penalty of death, to have nothing to do with foreign devil worship. But Dr. Horace Alen wrote in his diary for June 28, 1885, "Held our first stated Sunday service this eve after dinner... Dr. and Mrs. Herron, the elder Mrs. Scranton, and wife being present." Thus was initiated what eventually became Seoul Union Church, the oldest Protestant church in Korea. It would be hard to improve on the words of Dr. William C. Kerr that were published in The Korean Mission Field, May 1931. Dr. Kerr was at that time the pastor of the church and had access to records no longer available due to loss during the war periods. In July of 1886 the Northern Presbyterian Mission appointed a committee to confer with the Methodists in regard to the establishment of a church organization and the erection of a church building. It seemed to the joint committee, which met on July 17th, that there were enough foreigners in Seoul to warrant the erection of such a building at no distant date. Following the recommendation of this joint committee, the foreigners of Seoul met on July 25th and decided that the communicant members of the various churches represented form themselves into a church organization. Messrs. Bunker, Underwood and Appenzeller were appointed to draft rules, while another committee was to look after the services until the new constitution should be drafted. It was decided also that Drs. Allen and Scranton and Mr. Halbert consult Capt. Parker, the United States minister, as to the advisability of erecting a church building that they look up a site, and report on plans and cost. The minutes of the meeting state that a discussion followed as to "whether those present were actually an organization, this discussion being more spirited than spiritual!" Capt. Parker allowed the use of the legation office for the services, which were held subsequently on Sunday mornings at 11 o'clock. The Episcopal service was supposed to be used on alternate Sundays, but this plan was soon discarded. The constitution states that anyone who is in good and regular standing of an evangelical denomination may become a member by signing the constitution; while any non member may become so upon confession of faith in Christ, assent to the articles of the Apostles' Creed and the acceptance of the Bible as the word of God. Mr. H.G. Appenzeller was elected the first pastor. Two years later Mr. H.G. Underwood was elected to this office. In 1888 it was decided to hold the services in the guest house of the Presbyterian Mission. The matter of securing a lot for a church building continued to come up for discussion, and in 1889 three possibilities were reported on; one in front of Steward's to cost $300 Mex., one in front of the Russian legation to cost $100, and another in front of the American legation. Of these, the last mentioned met with the most favor. The finances of the new organization were as yet not greatly involved; but pulpit furniture was soon required; the hymnals, a bell, a communion set, and a pulpit Bible. The latter proved to be an imperfect copy, another had to be ordered from America. For a church bell there was put into use one that had formerly been used in a Buddhist temple. This weighed 150 lbs, and cost Yen 25. By this time, the services had been transferred to the school chapel of the Methodist Mission, and in return for its use, including lighting, heating and the general care of this room, the school was allowed the use of this bell on week days. In 1890, land in front of the American Consulate was bought in conjunction with the Reading Room Committee and the "Ladies' Tennis Club". For the payment of $250 Mex. the church secured the right to a plot 70 feet deep and 40 feet wide, the whole plot having cost $800 Mex. The church's share was soon oversubscribed, and the pastor could report the next year that 'we have acquired a good church site." Evidently the use of the church bell did not compensate for all the expenses of holding the services in the school chapel, for the next year the sum of $200 was paid to the school for coal. At the same time the treasurer was appointed a committee of one "to receive a fair price for a broken lamp in the hands of Bro. Hulbert." Elections must have been exciting in those days of the "gay nineties', for in 1894 it took six ballots to elect the pastor, and this was only a few more than on some other occasions. One wonders whether the suggestion which someone made that the pastor receive a salary of $300 had any thing to do with that. In 1904 there began what later proved a great power in the life of the church - a series of annual Bible Conferences. Along benevolent lines, substantial contributions were made to the Home for Destitute Children. In 1905 the services were transferred to the First Methodist Church; to Ewha Chapel in 1907; the Sunday School had been developing splendidly under the leadership of Dr. Hirst. He was succeeded in 1907 by Mr. Gregg. For a good many years no regular church offerings had been received, special offerings only being taken up as there was special need. At times the money needed was collected pro rata. In 1911 dues of one yen a year were decided on, and then in 1913 the change was made to a regular Sunday offering. 1927, when he resigned and returned to America with his family. Not long after that he was called to his rest. Mr. DeCamp was succeeded by a second generation missionary, the Rev. H.D. Appenzeller, whose father, the first pastor, had been elected to the pastorate for three subsequent periods of service. During those years there were only occasional references made to the lot which the church held. In 1912 willingness was expressed to rent it to the Foreign School, but nothing ever came of this. In 1916 an extract of the minutes of Nov. 27, 1890, was given to the Chairman of the Seoul Union , in which the limits of the said site were clearly defined. This was done in order to eliminate any possible difficulty. The Sunday School was growing, and to meet its needs the beginnings of a library were established. Other work for the children, in the nature of organizations of Boy Scouts and Cap Fire Girls (later changed to Girl reserves) were started. In 1919 the services of the church were transferred to the Pierson Memorial Building. In Nov. 1930, the experiment of holding sectional meetings for different parts of the city was tried. This resulted in a large increase in total attendance at weekday prayer meetings. In 1959 the trustees of the church appointed a committee to compile a church history for the 75th Anniversary. In this history, "The Story of Seoul Union Church", compiled by Dr. Charles A. Sauer, the stormy quarter century that included World War II and the Korean Conflict are described as follows. The few missionaries and other civilians interested in Protestant English service who returned to Seoul in 1946 attended one of the US Army services. The 24th Corps chaplain presided at Chung Dong Church at 9;30 am while the chaplain for the men of the American Military government held services near the capitol building at 11:00 am. The next step was to elect a pastor. Dr. William E. Scott was named, and he consented on the condition that either he or an associate pastor would conduct the devotional part of the service each Sunday afternoon, thus giving more continuity to the service. Prior to that time, the pastor had merely arranged for the speakers, usually preparing a list for three months at a time. Except when out-of-town speakers were present, the speaker of the day conducted the entire service, often the order of service subject to the whims of the day. Rev. Archer Turner, of the Methodist Mission, was named as associate pastor, to have charge in the absence of the pastor. 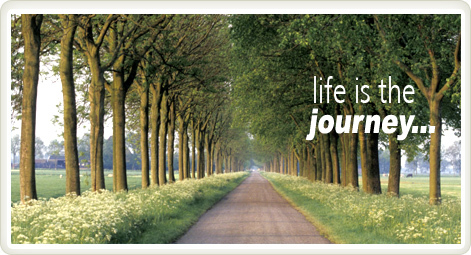 Thus came a transition from a series of unrelated services to a congregational unity which was highly appreciated. This of having both a pastor and an associate has been continued. Early in 1949, Morris hall became available, and services were transferred to that place after an absence of nine years. Atabout this time Dr. William E. Shaw was named pastor and Dr. Francis E. Kinsler as associate. Morris hall served the congregation for about one year. Then came the fateful day of the red invasion, Sunday, June 25th, 1950. Even as the afternoon service was being held, one member of the congregation, Dr. A.K. Jensen, was behind enemy lines. Before the sun rose again, the women and children of the congregation would be out of Seoul. Before another Sunday rolled around, the rest of the congregation would be behind the lines, in Japan, or enroute to Taegu, wondering just how far they would really have to go. On November 11th, 1953, the chapel at TaiWha Social Center became available for afternoon services, but no other meeting could be held as it was still occupied by a U.S. Army unit. The entire Center building was finally released to the Methodist Mission in 1954. This beautiful chapel, centrally located, has continued to be the home of Seoul Union Church, although it was necessary to have services in the Salvation Army headquarters in Chung Dong that summer while the Center was being renovated. The congregations has worshipped in many auditoriums, but this product of native architecture is its first real place of worship. 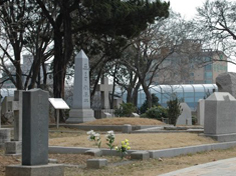 Seoul Union Church had had need of a last resting place for one of its charter members within four years of its organization. Dr. John W. Heron passed away the summer of 1890. 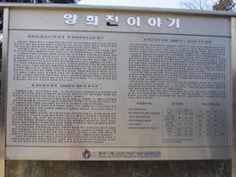 The Korean government was slow in granting a grave site until the missionaries began preparations for temporary burial near Dr. Heron's house, not far from the present site of the Methodist "Gray House" in Chung Dong. Burial within the walls of the city was strictly forbidden. The first exception was the first queen of the Yi dynasty. Chung Dong gets its name from the fact of her burial in the area, although a later king saw to it that her grave was removed to the present Chung-Neung site. The only other exception was the late Bishop Trollope who lies buried under the alter of the Anglican Cathedral. When it appeared that the foreigners were about to violate this sacred taboo, officials hastily offered one site after another until the present site on the banks of the Han River was approved, and Dr. Heron's body found a resting place outside the city walls. Other charter members, who after a full life, came to rest in this beautiful cemetery, include Dr. Homer B. Hulbert, Rev. and Mrs. D.A. Bunker, Mrs. Horace G. Underwood, mars. Mary F. Scranton and , last of all, the first person baptized by these early pioneers, Alice Rebecca Appenzeller. During the pastorate of the Rev. Edwin Kilbourne, it became apparent that Seoul Union Church should plan for a wider ministry. The increasing number of Americans in the Seoul area called for more time than a busy missionary could give, and there was need of extended pastoral service to unchurched people. A church development committee consisting of Robert G. Sauer, Capt. Goeffrey Perry, and Rev. Kenneth Foreman, Jr. was named to formulate an advance program. The committee surveyed the financial situation and proposed the calling of a regular salaried pastor, with enough pledges to make the program workable. The Rev. Victor I. Alfsen of the Presbyterian Church of Fairbanks, Alaska, was called to the pastorate. Mr. Alfsen arrived in November, 1958 and at once began a wider program, which soon called for the addition of a Sunday morning service to accommodate those who found it more convenient to worship at that hour. The committee also continued to study possibilities of raising funds for a church building. For some time it was thought that a joint building program with the Committee for Ministry to US Service Men might become a reality. However the congregation did not fully support any building program and services have continued at TaiWha Social Center Chapel. Mr. Alfsen served as pastor until the end of June, 1961. As his successor, the congregation has called the Rev. Everett N. Hunt, Sr., pastor of the Methodist Church of Stratford, New Jersey, and now looks forward with renewed confidence to the future under the leadership of the new pastor. The DOM was instrumental in locating ministers interested in a call and provided an initial salary subsidy to help the Seoul Union Church meet the expanded outlay required. While the congregation rose to the challenge, the economic situation in the mid-sixties was such that on the termination of the contract with Rev. Everett Hunt the church returned to community leadership. From the fall of 1967 until his furlough in 1968 Rev. Hobart Johnson gave leadership which was sorely missed when he left. Once again in 1970 the congregation voted to call a full time pastor, this time the Rev. Glenn Fuller who came in the summer of that year and served until the summer of 1973. Faced with a continuing decrease in the number of ordained ministers in Seoul, the heavy loads carried by those here, and the need for full time pastoral leadership, the congregation once again voted to call a full time pastor, and Rev. Howard Fritz responded to the call in March of 1983. There were other factors affecting the church during these years. Through the good offices of Dr. Roberta Rice a Hammond organ was secured in 1970 which has added much to the beauty of the services. During this period the morning service gained popularity and the Sunday School was moved to the morning preceding this service. In 1970 an 8:30 a.m. service was started, replacing the afternoon service for those who desired to attend Korean services. Also during this period several other English language churches developed. The International Lutheran Church, the International Baptist Church, and an Evangelical congregation in addition to the military services on base offered a wide range of services for the English speaking community of Seoul. Unfortunately, only a small portion of the expatriate population attends any church. During this quarter century the budget for the church increased from about $10,000 annually to $90,000. The church grew strong in benevolence giving, with support to projects both in Seoul and overseas. It is interesting to note that while the church has existed for a century it is not a legal entity; it has no address and owns no property. In 1978 the Seoul Union Church Foundation was established, registered in the State of Delaware, to provide a legal entity in the United States that could receive and hold funds for the church. As one looks over the history of the church a recurring theme is the building of a church building. 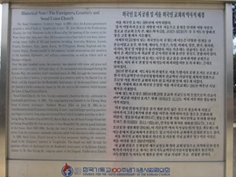 The Korean church leaders as a part of their plans for the celebration of the 100th Anniversary of the arrival of Protestant missionaries in Korea proposed a project to construct a chapel at Yang Wha Jin, the Foreigners' Cemetery. Seoul Union Church was started to meet a need - the need among foreigners in this city for Christian fellowship and community worship. Over the years the persons have changed, the place has shifted, and the specific form of the need has varied, but Seoul Union Church has been and is here, a source of worship, encouragement, fellowship, and love. 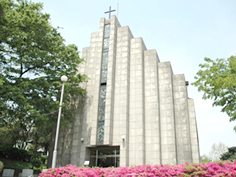 In 1985 Seoul Union Church moved into the Memorial Chapel in the Foreigner's Cemetery Park. Rev. Roland Hughes served from 1986 to 1989. Rev. Jack King served from 1990 until 1993. And Rev. David Pederson has served from 1994 until now. However, the real strength of the church has been the lay leadership. The annual budget has increased to USD 200,000. Benevolence, youth, and work among foreign students has been strong. Christian education for children and adults is attended by nearly all of the regularly worshipping population. And Seoul Union Church is known as a friendly church. Various union services had preceded the organization of a church. The first Union Sunday church service was held June 28th 1885, with the Allens, Scrantons, and Herons present. Dr. Underwood reports that the first missionaries (Underwood, Dr. and Mrs. H.G. Appenzeller, Dr. and Mrs. W. B. Scranton) gathered in Seoul on New Year's Eve, Dec. 31st, 1885, for worship and prayed to God to give them souls that very next year. Alice Appenzeller, infant daughter of Dr. and Mrs. H.G. Appenzeller, was baptized April 25, 1886, the first Protestant baptismal service in Korea. A Thanksgiving Service of the Union Church was held at Pai Chai Chapel, the regular place of worship on Nov. 28th, 1901. There was a short address by Mr. Philip Gillette, the new secretary for the YMCA, and the main address by Rev. H.G. Appenzeller. In 1903, the thanksgiving Service was held "at the usual meeting place of Union Church" with an address by Homer B. Hulbert and an offering for the Home for Destitute Children. KOREA REVIEW 1901 and 1903. Here the Editor of the Korean Mission Field inserted a note to the effect that "Since the above was written definite decision has been made to begin a building program for Seoul Union Church." Seoul Union Church continued to use Morris hall until November, 1940. War clouds were on the horizon and American and British consular officials were advising their citizens to leave the orient. On Saturday, November 16th, of that year, 216 missionary men and women, and children, sailed from Inchon on the S.S. Mariposa. Morris Hall was not too large for the congregation that remained, and on the next day services were held at the Seoul Union Club. Here the dwindling congregation continued to meet until Sunday December 7th, 1941. On Monday morning, the 8th, World War II was a fact. The dozen or so men of the congregation were escorted to The Methodist Seminary where a class-room became their home until repatriation six months later. Dr. Kerr reports that they held regular services each Sunday!